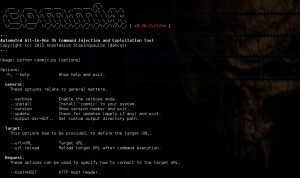 Browse: Home / Commix v0.7b – Automatic All-in-One OS Command Injection and Exploitation Tool. * Added: New option “–flush-session” for flushing session files for current target. 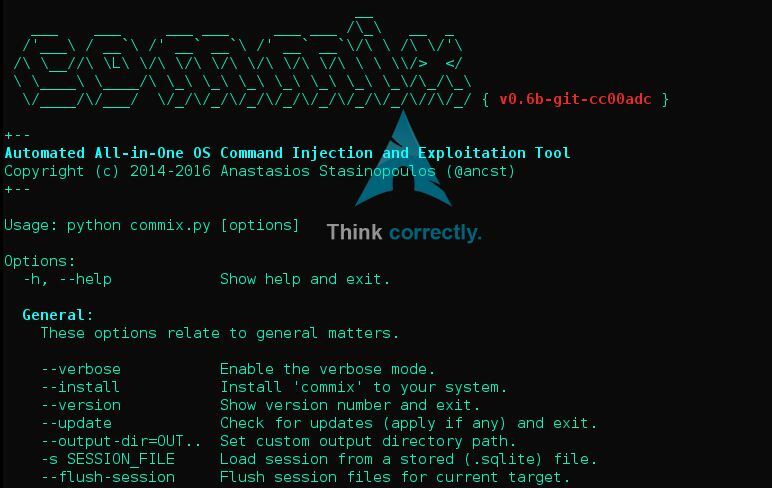 * Added: Support to resume to the latest injection points from session file. * Added: Payload mutation if WAF/IPS/IDS protection is detected. * Added: Check for existence of WAF/IPS/IDS protection (via error pages). * Added: The “set” option in “reverse_tcp” which sets a context-specific variable to a value. + Added: Time-relative false-positive identification, which identifies unexpected time delays due to unstable requests. + Added: New option “-l”, that parses target and data from HTTP proxy log file (i.e Burp or WebScarab). + Added: Check if Powershell is enabled in target host, if the applied option’s payload is requiring the use of PowerShell. + Added: New option “–ps-version”, that checks PowerShell’s version number. + Replaced: Some powershell-based payloads, have been replaced by new (more solid) ones, so to avoid “Microsoft-IIS” server’s incompatibilities. + Added: Support (in MacOSX platforms) for a tab completion in shell options. + Added: Undocumented parameter “-InputFormat none” so to avoid “Microsoft-IIS” server’s hang. + Added: Ability for identification of “Microsoft-IIS” servers. + Added: Statistical checks for time-related (“time-based”/”tempfile-based”) techniques. + Added: Support for Windows-based (cmd / powershell) payloads for every injection technique.ng..
← gef updates – Multi-Architecture GDB Enhanced Features for Exploiters & Reverse-Engineers.